MSGM jacket, SAINT LAURENT BY ANTHONY VACCARELLO t-shirt, pants, shoes, belt and bracelet. When you’re a young, up-and-coming film actor with growing cachet, it would stand to reason that if you were living in New York City, you might plant your roots in a trendy area. Maybe the East Village or the Lower East Side for the cool cafes and lively nightlife, Bed-Stuy or East Williamsburg for close access to thriving artistic communities. But when you’re a young, up-and-coming film actor with growing cachet and a kind of maturity well beyond your years, there are other considerations in mind. 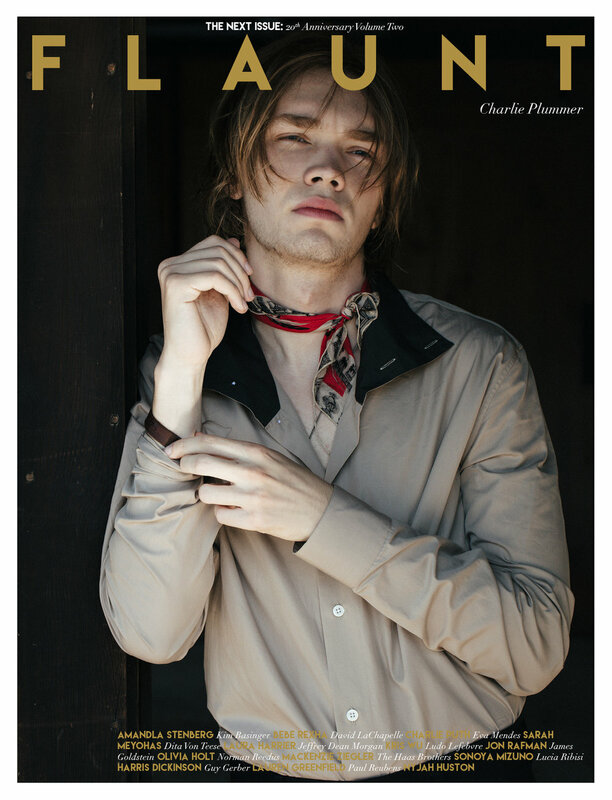 For nineteen-year-old Charlie Plummer, “looking cool” is not, at the moment, one of them. To spend a considerable amount of time with Plummer, as well as watching his films, is to understand why he might feel this way. Plummer, who won the Marcello Mastroianni Award for best emerging actor at the Venice Film Festival last year for his role in the Andrew Haigh-directed Lean On Pete, is not really your average teen. That’s because the characters he’s chosen to play over the few short years of his post-adolescent career have not been easy—they’re dark, sad, abandoned, lonely, often put in tragic circumstances that are out of their control and spiraling fast. It’s no wonder he might, during his down time, seek some peace and quiet. ACNE STUDIOS jacket, MISSONI shirt, CK JEANS jeans, and stylist's own hat. The most recent of those troubled characters was Charley Thompson, a teen boy who, after becoming unexpectedly orphaned, finds solace in an aging racehorse named Lean On Pete. Acting alongside Steve Buscemi, Chloë Sevigny, and Steve Zahn, Plummer performs youthful idealism that turns into a desperate search for hope, a hope that he looks for in anyone, anywhere. The film is a road trip movie in the loosest sense of the term—Plummer’s character, with his companion horse, are on a trip across the country that gets darker and more traumatic as the slow days pass. But it’s Plummer’s talent for appearing both wizened and child-like that carries the movie through more than a handful of sinister moments. You need not know much about Charley—and by extension, Plummer—to instinctively root for him. LEVI'S jeans and jacket, LEVI'S MADE AND CRAFTED shirt, SAINT LAURENT BY ANTHONY VACCARELLO necklace and bracelet, and stylist's own hat. His close family feels the same way. When the film premiered at the Venice Film Festival, Plummer’s parents, grandparents, and then eleven-year-old brother traveled to Europe to support him. Plummer was born in upstate New York, but his family moved around a lot throughout his life, so the Upper West Side has only recently begun to feel like home. His mother is Maia Guest, primarily a theater actor, and his father, John Christian Plummer, is a writer and producer. Because of their occupations, relocating to places like Salt Lake City and L.A. for shoots and stage productions was treated as an inevitability. DIOR HOMME jacket and pants, COACH shirt, and stylist's own hat. That kind of collaboration and teamwork has taken him from projects like the Oscar-nominated drama All the Money in the World (the same one that Christopher Plummer, no relation, was green-screened into after sexual misconduct allegations were made against Kevin Spacey) to the Duncan Skiles-directed suburban thriller Clovehitch. He’s now acted alongside Marisa Tomei, Timothy Olyphant, Andy Garcia, Amber Heard, Mark Wahlberg, and Katherine Langford. Michelle Williams has played his mother. He’s been directed by Ridley Scott. Dylan McDermott has been his father. Steve Buscemi has acted as his begrudging caretaker. One of his favorite moments in the industry so far was meeting Guillermo Del Toro at the Venice Film Festival, where the beloved filmmaker had just won the Leone d'Oro for The Shape of Water. STELLA MCCARTNEY shirt and stylist's own hat. Earlier this year, director Ridley Scott said that Plummer reminded him of Leonardo DiCaprio, predicting that, like the recent Oscar-winner, “he’ll have a big career.” In King Jack, where Plummer plays a teenage loner who is often shirtless and wearing a long chain, DiCaprio does feel omnipresent. In his role as John Paul Getty III during his harrowing kidnapping, Plummer telegraphs a pure anguish, oscillating between resignation for the position he is in and frothing anger toward a world that allowed this to happen. The viewer hungrily craves reprieve for Getty, a feeling that DiCaprio has evoked often in his own films. But DiCaprio is not the first comparison that has been foisted on Plummer, and until the young actor gains a solid foothold in the Hollywood imagination, it likely won’t be the last. For his roles in both King Jack and Lean on Pete, critics compared his demeanor and skill to the late River Phoenix. In looks, it’s obvious—like Phoenix, Plummer’s mien is both boyish and world-weary, innocent and tormented. In talent and style, the effect is more subtle: the pair offer so much openness and emotion to the screen while appearing to do so little. To better understand his predecessor, Plummer tasked himself with watching the thirteen films Phoenix acted in in his short twenty-three years. It didn’t take long for him to grow obsessed. OFF-WHITE C/O VIRGIL ABLOH jacket and pants, SAINT LAURENT BY ANTHONY VACCARELLO shirt and belt, and stylist’s own shoes. While slowly working his way through a couple sunny-side-up eggs, Plummer lowers his eyes and speaks intently when talking about Phoenix—on this subject, he wants to get his words exactly right. He just watched Phoenix’s My Own Private Idaho again for the fifth time, in 35mm at The Metrograph, and the actor has been on his mind. Is the hope that Plummer will do a similar kind of thing in his own work? DIOR HOMME jeans, SAINT LAURENT BY ANTHONY VACCARELLO necklace, belt and bracelet, stylist's own shirt and shoes. If you’ve watched any of Plummer’s films, you might beg to differ. But only to a certain extent: with mile-long stares, protracted silences, and hope against hope that a better world exists somewhere out there, Plummer’s characters could not be retrofitted to be played by any other actor. He is a true original, with an evocative talent that is all his own. For his part, Plummer doesn’t spend a lot of time mulling over past successes, or applauding his achievements. His tendency, he explains, is to always be looking toward to what’s next, though, for his own emotional wellbeing, he’s occasionally had to stop himself from worrying too much about what he can’t control. Either way, one thing seems to be certain—there will be more, and bigger projects to come. Case in point is Clovehitch, a terrifying thriller about a serial killer who is closer to Plummer’s character than he would like to believe, will release this fall. As we chat about the project, I explain that I found the movie difficult to get through. Before I can say it was because I am easily frightened, he unblinkingly responds, “Oh, no, no, that’s totally fine!” Ever humble, he’s ready to accept that a journalist who had come to interview him did not even like his upcoming film and wanted him to know it. I explain that I did like it—I was just terrified. “I thought you were going to be like, ‘Oh, it's just not good,’” he laughs, gently. We begin to wind down our conversation, but not before I ask Plummer about how he sees the industry evolving, especially now that he is one of the anointed class of freshmen who will inherit it, flaws and all.